One of the most appreciated New York gifts I bring to family and friends around the country is a packet of a half-pound of corned beef and a half-pound of pastrami, double-wrapped in foil, from the Carnegie Deli. On my most recent purchase on Feb. 22, the counterman, perhaps recognizing a loyal customer, threw in a bonus: an eight-ounce container of mustard instead of the usual little one-ounce cups. But at the airport, to my dismay, even though I had placed the container in a clear plastic bag atop my suitcase at the checkpoint, the mustard was red-flagged. 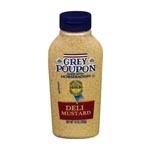 Can you find the reason why the mustard was verboten? Right. Eight ounces. Three ounces, yes. Four, no. You may wonder: wasn’t the strange magic power of the plastic bag enough to contain its possible lethality? No. Remember the rules: 3-3-1. Three items, three ounces each, in one bag. Adjust your mustard-smuggling accordingly, and you sail through the security line. And by “Sail” I mean shuffling along in your socks holding up your pants because the belt had to go in the tray. We take off our belts because of the Batman Terrorist who had all kinds of things on his utility belt. I think. If you’re old you don’t have to take off your shoes or jacket, but that will change if there’s ever an incident with a senior citizen who tries to bring down a plane with a windbreaker. Yet the multibillion-dollar budget for Campus 2 could add fuel to the debate about what Apple’s doing with all its money. Investors didn’t squawk much when Apple was dominating the smartphone and tablet market, but shares have fallen 38 percent since September amid rising competition from Samsung Electronics and concerns about Apple’s product pipeline. The squawking will intensify the next time Apple releases its earnings, and admits that while it made more money than ever the rate of growth of making more money than ever has slowed. SELL SELL SELL. Well, that’s the URL, anyway. 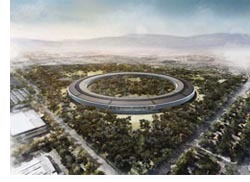 Apple’s Campus shakes up as an investor relations nightmare. Concerns over the product pipeline? That could mean A) they will sell a Watch, which everyone things is the next big sure thing, or B) they won't, or C) they will sell a cheap iPhone, which will broaden market share, or D) they won't, which will mean they're ignoring market share for silly things like "reaping huge profits from existing lines, or E) they won't or will do something else RIGHT NOW that will redefine an entire market. Rinse, repeat, then say "nevermind" when they bring out hoverboards or holographic digital assistants or something. Few architects will publicly question the judgment of Jobs and Foster, but many privately snicker at the doughnut-shaped design. At a time when Google, Facebook, and others favor floor plans that promote as many chance meetings as possible—a Jobsian virtue—the circle could isolate people and teams. A circle does not allow for much flexibility. Remember the story about how they invented the iPhone? Two people ran into each other while walking down the hall; one was carrying an iPod and the other a Cell Phone. They collided. You got phone calls on my portable music player! No, you, got music on my portable phone! Light bulbs above both heads. Wow, we gotta take this to Steve. I’m not saying it’s one thing or the other, good or bad. For all we know there’s a ceiling-mounted claw that picks up random employees and drops them in other parts of the building, just to foster chance meetings. The more I read about things like custom curved glass, the more I think “it’s going to leak.” Anyway, they can’t cancel the building now. Moreover, in Silicon Valley, nothing says you’ve peaked quite like a lavish new HQ. Highfliers such as Silicon Graphics, Borland Software, and Sun Microsystems all suffered the “campus curse”: Their fortunes went south soon after opening swank corporate villages. Sound familiar? Maybe it's Best not to Buy a new HQ. Rent for a few decades. See how that goes. Dang. Not because I was eager to play another Star Wars game - no interest in those anymore, since they’re all 3rd person, and I prefer FPS. You don't feel like you're spending all your time looking at someone's back. 1313 looked great, but they all look great nowadays. No, “Dang” because of the old games long gone and never forgotten by long-in-the-tooth players. This was absolutely cinematic in the 90s: Full Throttle. Does anything make more sense than Indiana Jones + Atlantis? That version must have been something released on those new-fangled CD-ROMs - when I played it, the game arrived on seven floppies, and there wasn’t room for pre-recorded dialogue. Kids today with their laconic heroes uttering generic observations. There was also Grim Fandango, which I never finished. Got stuck. I think I was on a ledge; a rope was involved. There’s a time in your life when you have three hours to figure out how to get down from a ledge using only a broken kite, a marble vase, a fragment of a pinata and a legal-sized manila envelope. When that time passes, you’ll know. WEB Last week I wrote about peculiar, brain-taxing writing on sites designed to rank high in Google searches, thereby providing nothing more than eyeballs for an ad. It’s unfair to beat up on some people who are doing their best for a pittance, but it’s almost as if a new style of prose is being invented before our eyes. Businesses today are all aware of the importance of the social media so they are all getting involved engaging with their audience in this manner, but unfortunately not all companies out there know how to properly write for this media and that’s the reason why many of them don’t see the social networking success that everyone talks about. Do you get all the sense of a person who is writing all the words that will be engaging to the reader which is of the reason in this manner, also to be making as many words so to be 500 words at the end? In other words, like a high school essay. Pad it out! Pad every sentence! The top of the page says it’s written by a "chief writer for bestessays.com." Save Time With Our Essay-Writing Service: Have you ever thought about how much time you spend on paper writing? Even if you are a talented essay writer, creating the best essays takes time. This is time you could be spending with your friends and family, working at your job, or just taking care of your other school assignments. Since 1997, BestEssays.com has been saving students' time with our essay-writing service. All you need to do is to hand over your assignment to our professional paper writers and you will receive the best essay writing in the industry. If I set up a company to sell essays to students who didn’t want to do the work, I’d hire nothing but mediocre writers. The teachers would be more likely to question the provenance of the essay if you handed in something that had words like “Provenance.” Hmm. He used provenance instead of origin. Unlikely. Unless he used a thesaurus, but he probably thinks that’s a type of dinosaur. Doesn’t strike me as the type of student who knows there can be more than one word for a concept or object. They offer three levels of writing - standard, premium, platinum. The last two are the best because the writers have Masters degrees AND PhDs! You remember the times you finished a book you really loved, and looked up the author's bio: it was a given he had a PhD in WRITING; only question was where it was from.